I very much looked forward to reading this book, expecting a lot. 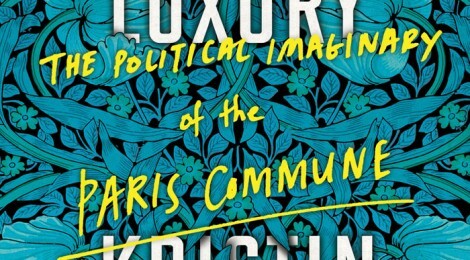 I had imagined that it would deal with the liberating and liberatory aspects of the Paris Commune in detail. Instead, I was disappointed by the factual errors contained within its pages. The biggest one is contained in the title itself. The expression “Communal Luxury” was first mentioned in the Manifesto of The Federation of Parisian Artists, active during the Commune and which included notable artists like Gustave Courbet, who was influenced by Proudhon, in its numbers. The term itself was probably coined by Eugène Pottier, who went on to write the Internationale. The Federation did not mean it in Ross’s sense, that is, as she says in her own words, “where everyone, […] would have his or her share of the best”. In fact the Federation meant that artists should produce works for the beautification of the city, rather than for private collectors – public art rather than private art. Ross recognises this to an extent but quickly passes over this to use the term in a number of different ways. Other errors include The Kanaks, indigenous people of New Caledonia, being referred to as Kanucks (an often quite derogatory American term for French Canadians), whilst Marie Verdure and Elie Decoudray (who initiated plans for crèches under the Paris Commune), are referred to as “two women” when in fact Elie Decoudray was Verdure’s husband! As regards the titular term “political imaginary”, it was first appropriated from the French psychoanalytical Jacques Lacan by Cornelius Castoriadis (one of the founders of the French libertarian socialist grouping Socialisme ou Barbarie). He used it to mean that “societies, together with their laws and legalisations, are founded upon a basic conception of the world and man’s place in it”. Writing on the Commune himself, Castoriadis refers to the Autonomous Imaginary, where a society defines itself without the mediation of religion, economists and politicians. Strangely, Castoriadis is not mentioned once in Ross’s book. I’m afraid I became quite peeved with the impressionistic, scattergun approach of the book, not to mention a sometimes practically inaccessible academic style. Ross refers to the Gustave Lefrançais’s account of one of the many public meetings held by the radical clubs and associations in the run-up to the declaration of the Commune. A speaker “cried out an appellation that had been deeply forgotten for a quarter of a century: Citoyennes et citoyens!””. Ross acknowledges the term Citizen had been kept alive as an expression from 1789 by the various revolutionary secret societies. It encapsulated the ideas of the French Revolution of 1789. In sum, it looked back to that Revolution, rather than forward. I would argue that its use points to what was one of the main faults of the Paris Commune – that is, that some radical currents, in particular those with influence within the directing bodies of the Commune, looked back towards Jacobinism and its methods like the Terror and The Committee of Public Safety. In fact the libertarian minority, people like Varlin, Vallès and indeed Lefrançais, fought unsuccessfully (as part of the directing committees) against the inauguration of a new Committee of Public Safety and against the use of terror. However, Ross fails to mention these problems and instead at great length sees the term Citizen thus: “its iteration in this instance creates the now of a shared political subjectivisation, “the uncomfortable class struggle of the present””. Much is made of the influence of the Russian activist Elizabeth Dimitrieff on the organisation of the Commune, in particular the Women’s Union For The Defense of Paris and Aid To The Wounded. She quite correctly describes this as an important and effective organisation, with its creation of producer cooperatives sewing workshops. However, Ross seems to think this was down to a single-handed effort by Dimitrieff herself, and not to the collective effort of the Union itself, as well as other leading activists within it like Louise Michel and Paule Minck. In Ross’s view this was because Dimitrieff had read the works of the Russian radical Nikolai Chernyshevsky, and in particular his novel of ideas ‘What Is To Be Done?’ She describes Chernyshevsky as one of the “two most significant political thinkers of the time”, the other being Marx; however little was known of him outside of Russia at the time. In this novel, Chernyshevsky advances ideas of a women’s sewing collective, “transforming private enterprise into a production cooperative, and then a cooperative at the level of consumption as well, encompassing all aspects of daily life”. Undoubtedly Chernyshevsky’s influence on Dimitrieff in turn influenced the Women’s Union, but there were also other influences at play. Many of the revolutionaries involved in the Commune were influenced by the ideas of Pierre-Joseph Proudhon, who himself posited producers cooperatives. It might be seen as contradictory that a rampant misogynist like Proudhon would have a strong effect on a women’s revolutionary organisation, however quite a few Communards cherry-picked the best of his ideas while turning away from his viciously anti-women obscenities. Despite this influence, Proudhon is mentioned only in passing in the book. Ross also blurs the acute differences between Marx and Bakunin within the First International stating in an interview elsewhere that “If you broaden your focus a little beyond the tedious “political theory” discourse, you can see – especially in the people that I studied – a group of thinkers and militants who are slavishly beholden neither to Marx or to Bakunin, but who are busy performing a bricolage of anarchist and marxist ideas – a creative mixture that resonates very strongly with militant culture today”. Whilst one of those thinkers she addresses – William Morris – might have attempted such a “bricolage”, the others , Kropotkin and Reclus, were both pronounced anarchist communists with Kropotkin in particular being very hostile towards Marx. It would be mean-spirited to deny that there is not much of worth in this book. Ross’s exposition of the development of anarchist communism is worth reading as is much of the description of the positive aspects of the Commune. Too often, though, it felt as if Ross was pitching this book at the Occupy! Movement and its supporters in the USA and elsewhere. Not a bad thing if it wins those over to a more radical and explicitly libertarian position. However, this too often gets in the way of a clear account of what were the best lessons from the Paris Commune of 1871.